This article tackles the current deficit in the supply of cadaveric organs by addressing the family veto in organ donation. The authors believe that the family veto matters ethically as well as practically and that policies that completely disregard the views of the family in this decision are likely to be counterproductive. 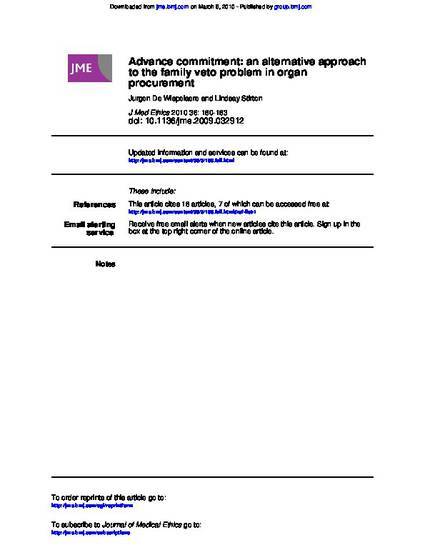 Instead, this paper proposes to engage directly with the most important reasons why families often object to the removal of the organs of a loved one who has signed up to the donor registry notably a failure to understand fully and deliberate on the information and a reluctance to deal with this sort of decision at an emotionally distressing time. To accommodate these concerns it is proposed to separate radically the process of information, deliberation and agreement about the harvesting of a potential donor’s organs from the event of death and bereavement through a scheme of advance commitment. This paper briefly sets out the proposal and discusses in some detail its design as well as what is believed to be the main advantages compared with the leading alternatives.